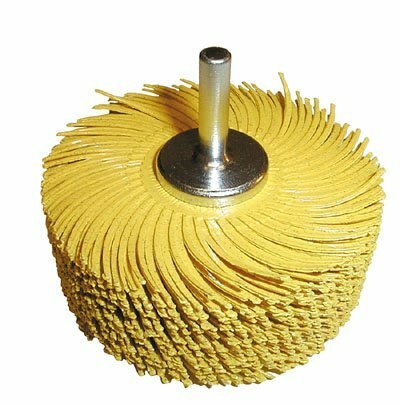 Goodson 3M Roloc Bristle Disc 2"
GOXAWEE Radial Bristle Brush Disc is 100% brand new and high quality. We designed our disc to last longer than wire and other abrasive discs, Unique 3 dimensional flexible abrasive design provides for a uniform finish. Use forremoving firescale, heavy cleaning, pre-polishing, texturing and polishing. Open design dissipates heat, unlike rubber wheels. Bonded cubitron mineral abrasive is much harder than most metals. Flexible bristles require less pressure than wire brushes and conform to contours, even on complex parts. Bristle spacing is ideal for coating removal and other high-loading substances. The detail abrasive brushes have very flexible bristles which allow removal of the exterior "surface layer" without damaging the base layer below. Fit for most die grinders and rotary tools, perfect grinding effect and convenient to polish,simple to use, safe and reliable. GOXAWEE TOOL is the source for hard-to-find mini tools for crafts and hobbies . We take great pride in providing the best customer service in America. Whether you are a professional craftsman, a robot builder, or a model building hobbyist who requires precision small tools and micro tools, GOXAWEE Tool can help. 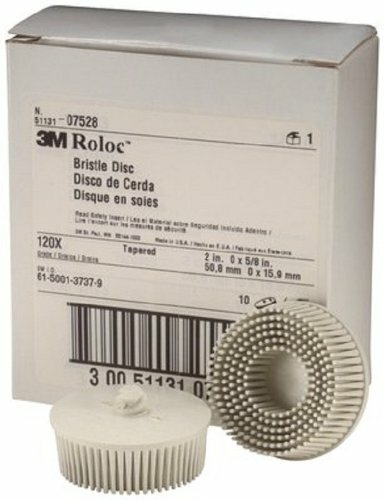 3M 18732 Roloc Bristle Disc Grade - 80 Grit, Size - 2". Disc is a molded, non-woven abrasive filled bristle disc for automotive use on aluminum and metal. Use for deburring, blending, finishing, polishing. Cleaning and for coating, defect, scratch and rust removal. Plastic brush-like bristle disc works with RolocTM system. Removes very little base material from workpiece.Shank Diameter: 5/8". 3M Scotch-Brite ceramic RD-ZB bristle disc is measured using outside diameter (OD), with the OD being 2 in. The quick change attachment allows for easy mounting to the tool or pad. WARNING: This product can expose you to chemicals which is [are] known to the State of California to cause cancer and birth defects or other reproductive harm. For more information go to www.P65Warnings.ca.gov. Scotch-Brite Bristle Discs & Brushes last longer than most abrasives and provide the same finish and cut throughout their life. An operator quickly and easily achieves a quality, consistent finish with light pressure. For productivity in automated procedures, there are fewer changeovers. These fast running discs efficiently clean or strip many substances from metal surfaces without damaging the work piece. 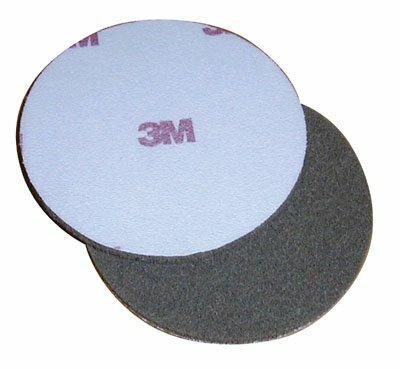 3M 18730 Roloc Bristle Disc Grade - 50, 2 Pack is a molded, abrasive filled bristle disc which is used for automotive use on aluminum and metal. Use this product instead of a wire brush for many tasks including: deburring, blending, polishing, finishing, cleaning, coating, defect removal, scratch removal and rust removal. 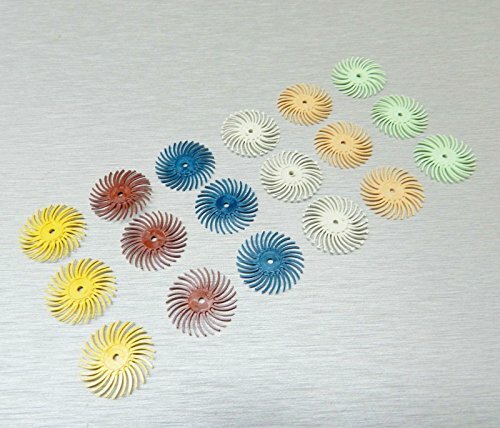 The product bristle disc is measured using its outside diameter which is 2 inches. It's quick change attachment makes it quick and easy to mount it to the tool or pad. The product rotates and spins, just like other products in its category, at the maximum speed possible. The bristle disc can run at a maximum speed of 25000 RPM. Grade: 50. Quantity: 2 Pack. WARNING: This product can expose you to chemicals which is [are] known to the State of California to cause cancer and birth defects or other reproductive harm. For more information go to www.P65Warnings.ca.gov. 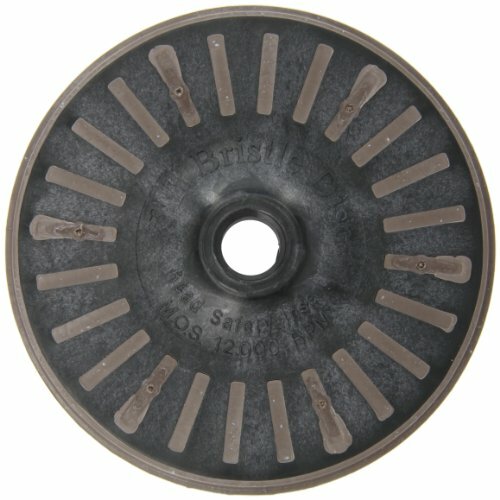 3M Scotch Brite 18730 Roloc Bristle Disc 50 Grade (1 disc) is a molded, abrasive filled bristle disc which is used for automotive use on aluminum and metal. Use this product instead of a wire brush for many tasks including: deburring, blending, polishing, finishing, cleaning, coating, defect removal, scratch removal and rust removal. The product bristle disc is measured using its outside diameter which is 2 inches. It's quick change attachment makes it quick and easy to mount it to the tool or pad. The product rotates and spins, just like other products in its category, at the maximum speed possible. The bristle disc can run at a maximum speed of 25000 RPM. Grade: 50. WARNING: This product can expose you to chemicals which is [are] known to the State of California to cause cancer and birth defects or other reproductive harm. For more information go to www.P65Warnings.ca.gov. Scotch-Brite(TM) disc is a molded, abrasive filled bristle disc instead of wire brushes for automotive use on aluminum and metal. Use for deburring, blending, finishing, polishing, cleaning and for coating, defect, scratch and rust removal. Consistent supply of abrasives. Clean and strips with light pressure. 2-inches diameter and white color. 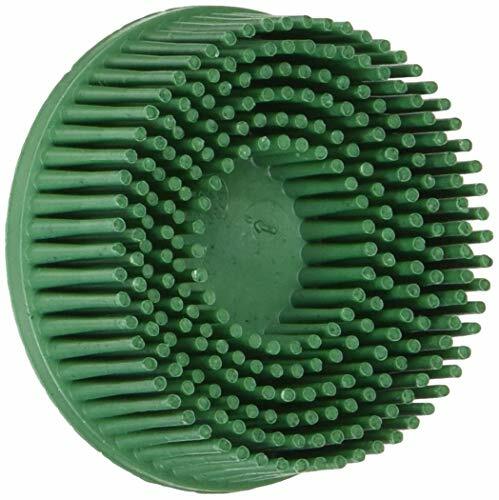 180 Grit Nylon Bristle Wheel for all Restorer Tools. Elastic nylon brush impregnated with abrasive grit. Used for roughing and deburring metal. Also can be used to create a rustic effect with even annual ring transitions on timber. HIGH MATERIAL ------ Radial Bristle Discs a new type of abrasive that is superior to sandpaper, flap wheels, or other types of sanders, brushes, or abrasive wheels. The bristle materials are long lasting and very effective. MULTI-PURPOSE & MULTIFUNCTION ------ The radial bristle brush is a idea for metalworking, paint prep, coating & corrosion removal and works well on aluminum, brass, bronze, carbon steel, cast iron, stainless steel, and other metals. Our detail polishing discs suit for deburring, cleaning, finishing, machining and polishing detailed parts, tiny areas and irregular places. 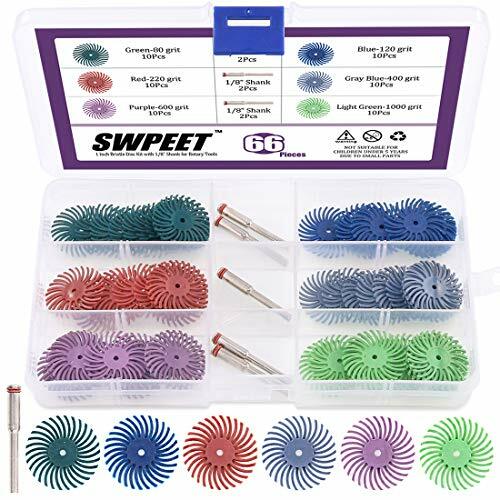 GREAT COMPETITIVE ------ Swpeet Fine polishing wheel brushes can be used with most multi-functional tools, such as Dremel drills, small grinders, rotary tools, etc. It is recommended that the manual speed be between 15,000 and 30,000 RP. EASY TO USE ------ Bristle disks can be stacked, flexible, cool, durable, and provide a uniform finish. Use as many disks as you can on the spindle as you need, and use them like a natural bristle brush, without any compounds - these compounds have been immersed in the disc material. The different colours of the disc indicate the grade. 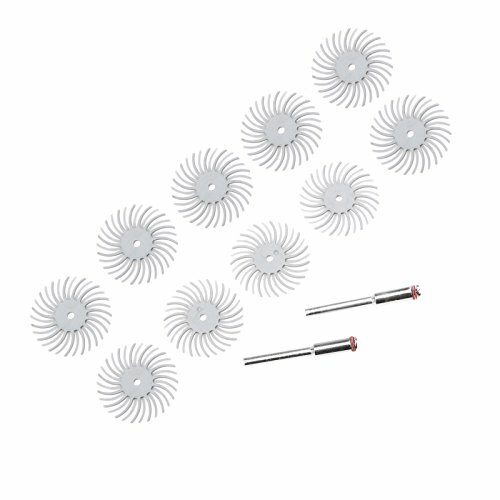 WHAT YOU GET ------ In this kit, You will get 60Pcs 6 Mixed Grit Radial Bristle Disc kit, These polishing brushes have 6 different grit with 6 various colour and every grit has 10 pieces for different needs. 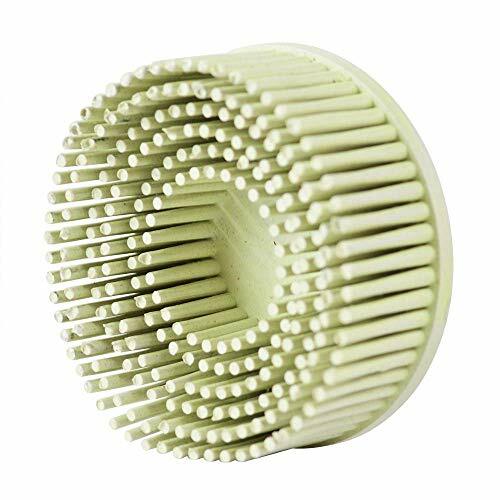 Including Green: 80 Grit; 120 Grit; 220 Grit; 400 Grit; 600 Grit; 1000 Grit; Meanwhile you will get 6Pcs 1/8 Shank perfect for Rotary Tools. Cabinet shop and furniture applications include: Light sanding of grooves. Light polishing of carvings. Vein sanding. Defuzzing crevices. 3 diameter. Sanding raised grain between sealer coats. Not for stock material. Scotch-Brite EXL Deburring Wheel features a hard, dense consistency that quickly deburrs, finishes, and polishes all types of metals, composites, glass and leaves a smooth, clean surface. 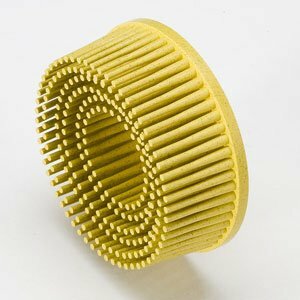 Its conformable characteristic makes the wheel ideal for deburring stamped or laser cut parts, or for finishing after belt sanding. 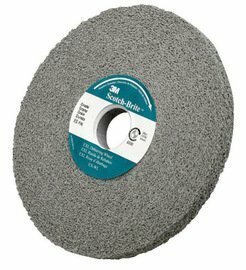 Scotch-Brite EXL Deburring Wheel is available with silicon carbide or aluminum oxide abrasive mineral. Silicon carbide is a synthetic mineral that is very sharp and commonly used for low-pressure applications such as paint prep and finishing. Aluminum oxide is a hard, blocky mineral that provides high cut-rate and long life. While silicon carbide breaks down faster than aluminum oxide, it produces a finer finish. Scotch-Brite is a unique surface conditioning product with abrasives incorporated into non-woven nylon fibers. Combining abrasives with the fibers creates an abrasive system that delivers consistent results for the life of the product. The open-web material is load resistant and keeps the abrasive minerals cutting at high performance by limiting clogging of the nylon fibers. Minimizes heat build up to reduce risk of discoloration and warping on heat-sensitive substrates. Use for deburring, blending, finishing, polishing, cleaning and for coating, defect, scratch and rust removal. 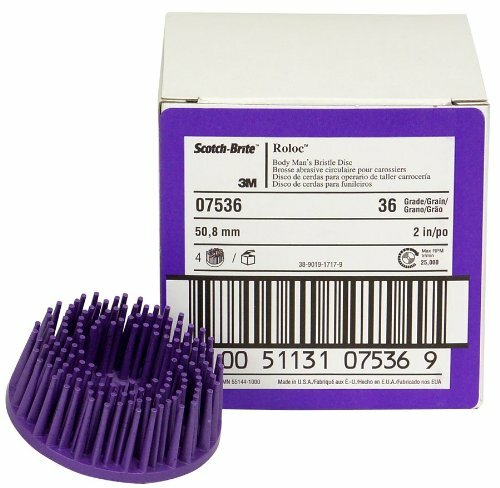 3M Scotch-Brite Roloc body man's bristle disc. A premium 3M ceramic grain 2 inch bristle disc constructed of a new bristle design that enables it to remove high loading substrates quickly, while maintaining product life. Removes high loading materials fast in automotive applications. Load resistant. Attachment type: Roloc quick-change. Converted form: bristle disc, Roloc disc. Equipment - Machines: disc sanders. Grade: 36. Max RPM: 25000. Size: 2-inches diameter. Purple color. Position: best. Mineral type: ceramic. 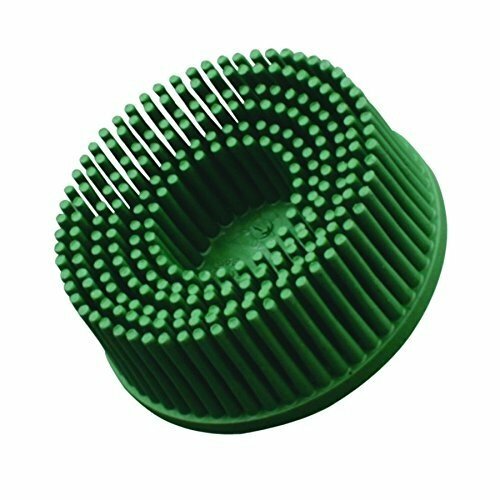 Alfa Tools Crimped Wide Face Wire Wheel Brushes feature dense, high quality, tempered crimped wire construction. General purpose brush for bench or pedestal grinders. Heavy duty, used for surface processing of metal, rubber, wood, plastic, glass, etc. Material: Nylon + Aluminum Oxide Grains. 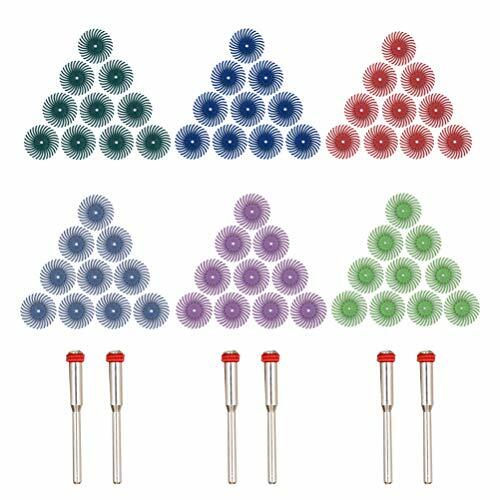 10Pcs Brush + 2Pcs mandrel. Light shooting and different displays may cause the color of the item in the picture a little different from the real thing. Since the size above is measured by hand, the size of the actual item you received could be slightly different from the size above. Please don't mind, thank you! Please choose which grit you want. For woodworking, dental laboratory, jewelry & crafts, die & mold shops etc. The bristle materials are long lasting and very effective. No damages to the original texture when polishing. 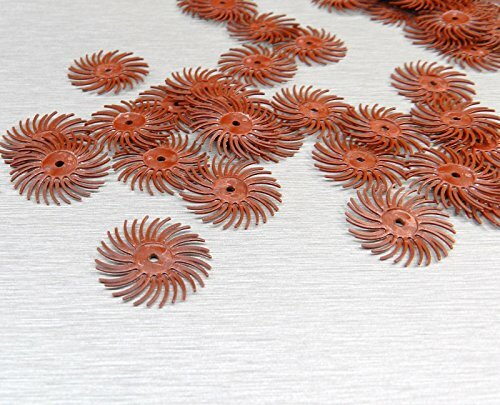 Specifications: Bristle Disc Diameter: 3/4" - 18mm Bristle Grade: Red - 220 grit Disc Center Hole: 1/16" - 1.56mm NOTE: See our store for mini Screw Mandrel Material: 3M Cubitron and Aluminum Oxide Grains Instructions: For optimum results use a minimum of 3 discs ganged together, more discs can be used for wider coverage Recommended speed from 5,000 to 15,000 RPM. 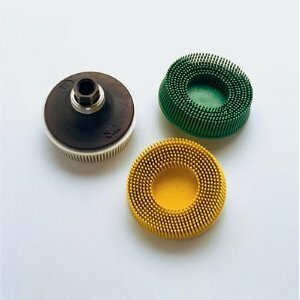 Maximum Operating Speed of 35,000 RPM Rotation must be with the Radius of Bristles No compounds, rouges or pastes required -Bristles contain abrasives. PACK OF 12- These are the unique 3M Radial Bristle Discs a new type of abrasive that is superior to sandpaper, flap wheels, or other types of sanders, brushes, or abrasive wheels. The 3M bristle materials are long lasting and very effective. APPLICATIONS: Woodworking - Woodcarvers will appreciate how well they remove the fuzzies without harming any of the underlying detail. This is a medium range 220 Grit Radial Disc, the last picture shows the stacked discs on a mandrel (not included in this Sale.... mini reinforced Screw Mandrel: 3/32Shank with 1/16 See our store for mandrel. Jewelry & Crafts - Jewelers and Metalsmiths use the various grits of these discs, for cleaning, pre-polishing, metal surface Satin Texture finish and polishing of precious metals. 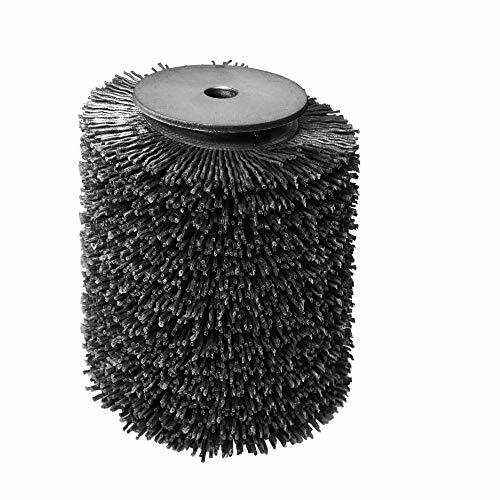 3M brush-like bristle disc removes coarse coatings from the large, open areas of a work-piece. Works on right angle tools quickly and easily with little or no pressure. Attachment type: threaded. Converted form: bristle disc. Equipment - machines: right angle grinders. Max rpm: 12000. Best position. Thread size: 5/8-11 INT. Measures 4-1/2-inches diameter. 36 Grit. Brown color.